Within three months this spring, author and part-time Missoula resident Kathleen Snow had two books published. Given that both revolve around grizzly attacks, or potential attacks, in Yellowstone National Park – one’s non-fiction; one’s a mystery – it may seem like a brilliant marketing ploy. Instead, Snow says, it was happenstance. In the fictional work, it’s up to the park’s chief investigator to figure out if the death of Melody Applegate was a mauling by a bear, or a murder – an attempt at the “perfect murder” – by a human. Snow’s New York agent was unable to peddle “Bear Eyes” to any of the big publishing houses a decade ago, so the author began submitting it to smaller publishers herself. Meantime, she says, “I decided since I couldn’t sell it but I’d done all this research, maybe I’d pretend to be a journalist” and write a separate, true-life book about grizzly-human encounters in the park. “Taken by Bear in Yellowstone: More than a Century of Harrowing Encounters Between Grizzlies and Humans” is the result. The second book was published first, in March, by Lyons Press. The mystery, meantime, was released in June, and was published by the University of Montana. And that’s why, when Snow does book signings – as she will Saturday morning outside Fact & Fiction, when Farmers Market crowds will be wandering up and down Higgins Avenue – the author will be scratching her name into not one, but two, books. Making it even more interesting is this: While Snow’s latest two books arrived within weeks of one another, more than a quarter of a century had passed since her last book came out. Snow grew up in a rural area outside Bloomington, Ind., where “roaming the woods and going to the lake” were very much a part of her upbringing. At the age of 21 she set out for Manhattan. “The goal was to be an editor. The goal was Random House,” she says, and while that never materialized, Snow carved out a career doing freelance copy editing, writing jacket copy for publishers, and working as editor at Where magazine, a tourist-oriented publication. Oh, and this happened, too: Snow read a headline in the New York Times. “Two Manhattan Career Girls Slain” it said. “It seemed to imply what happens when a young woman decides to leave the protection provided by a father, or husband, by venturing into the career zone in a big city,” Snow says. It struck a nerve with Snow, who had left southern Indiana for Manhattan, and the headline became gist for her first novel. “Night Waking,” published by Simon and Schuster in 1978, sold more than 250,000 copies. “A terrifying novel about paranoia,” the Chicago Sun-Times said of the book, about two roommates coping after a third roommate is murdered by a serial killer. Twelve years would pass – there were roses to be smelled – before Snow’s second novel, “Aguahega,” was published in 1990. It’s about conflict between a lobstering family and wealthy summer residents – and, eventually, the National Park Service – on a Maine island. 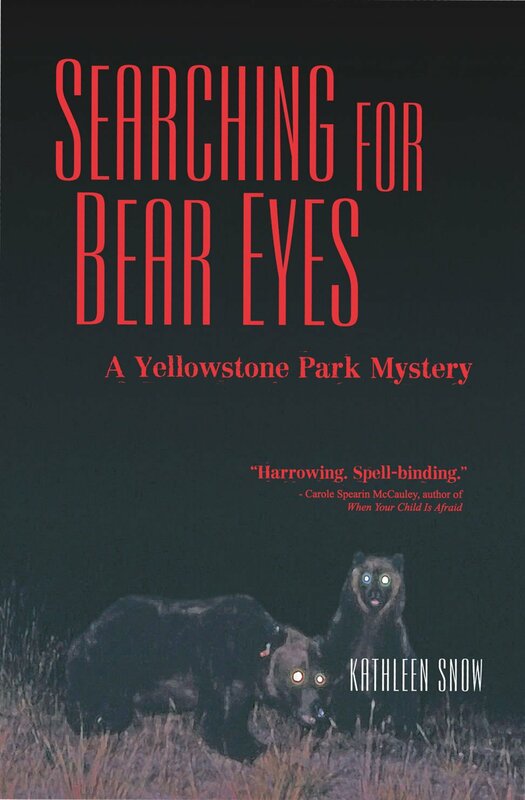 Then came the 26-year gap before the two Yellowstone books, but as has been explained, “Searching for Bear Eyes” was finished more than a decade ago. The continuing research for “Taken by Bear,” the stories of 100 years worth of real grizzly-human encounters, took up about that much time. Official reports were not easily available when Snow began writing the first of her two Yellowstone books. Snow’s agent – a friend Snow says has done a wonderful job – declined to represent her with “Taken by Bear,” maintaining a nonfiction book about grizzly-human encounters in Yellowstone was meant for a more local audience. “I disagree. I think interest in Yellowstone is worldwide,” Snow says. Her interest in the park goes back to 1963-64, when Snow worked for the Yellowstone concessionaire as a maid, hostess and “glass machine operator” – the official title of someone who loaded and unloaded dishwashers. The girl whose life in Indiana centered around the woods and lake had her attention distracted by other things as she entered her teenage years. She’s grateful to Gerald Fetz – retired as the University of Montana's Arts and Sciences dean, and former dean of the Davidson Honors College – for “almost single-handedly reviving” the University of Montana Press, which gave “Searching for Bear Eyes” a home. That, in turn, made it possible for her works of fiction and nonfiction – written more than a decade apart – to be published almost simultaneously. “It’s a supremely wonderful moment” to hold a book in your hands that you’ve written, Snow says. And it probably won’t be another dozen years before Snow finishes her fifth book. She’s already at work on her second nonfiction effort, this one about the history of grizzly-human encounters in Glacier National Park. That one, Snow says, could be out by next spring. Kathleen Snow signs “Searching for Bear Eyes: A Yellowstone Park Mystery” and “Taken by Bear in Yellowstone: More than a Century of Harrowing Encounters Between Grizzlies and Humans” on Saturday from 10:30 a.m. to noon at Fact & Fiction, 220 N. Higgins Ave.